The 1965 Formula One season, which was the 19th season of FIA Formula One racing, featured the 16th World Championship of Drivers and the 8th International Cup for F1 Manufacturers. The two titles were contested concurrently over a ten-round series which commenced on 1 January and ended on 24 October. The season also included a number of non championship races for Formula One cars. 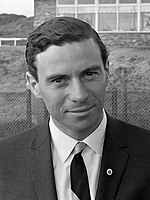 Jim Clark's second championship included six wins interrupted only by non-starting at Monaco whilst he was away winning the Indianapolis 500. Jackie Stewart finished third in the championship in his debut season and Richie Ginther won his only, and Honda's first, grand prix in the final race of the 1.5 litre formula. The Austrian Grand Prix at the Zeltweg Airfield, originally supposed to be run between the German and Italian Grands Prix, was cancelled after safety complaints made by the teams and drivers about the roughness of the track. The following teams and drivers competed in the 1965 FIA World Championship. Points towards the 1965 World Championship of Drivers were awarded on a 9–6–4–3–2–1 basis to the top six finishers at each round. Only the best six round results could be retained. Other Formula One races were also held in 1965, which did not count towards the World Championship. The last of them, the 1965 Rand Grand Prix, was the first Formula One race for cars with 3-litre engines.